Huesca, city, capital of Huesca (Province) is in the region of Aragon in northeast Spain and also near to Zaragoza which is in central Aragon autonomous community. It had been founded by the Romans and its name was first of all Ileosca and was the capital of the Vescitan (Iberian tribe). 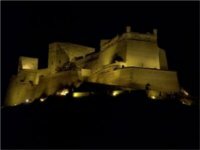 It later fell to the Visigoths and Moors and have been recaptured by Peter I of Aragon in 1096 and was its capital until 1118. Moreover, Huesca have an important cultural heritage, with numerous examples of Romanesque art, its wonderful architectural treasures, and also with many famous old buildings like The Church of San Pedro el Viejo (13th century), Huesca Cathedral (1515), the Town Hall in the former Convent of St. Francis (pre-13th century) and the Episcopal Palace, built in the Mudéjar (Christian-Islamic) style, The Royal Palace (Palacio Real), ancient residence of the kings of Aragon and former fortress of the Moorish walis (rulers), was reconstructed in 1845 to hold the university and later given to the Institute of Intermediate Education. And many other notable buildings also very nice. There are many bar in Huesca as Bar Rabason or Bar Zarauz with a good atmosphere, good musics and a typical Spanish design recalling the history of the city. If you want to go skiing in the Mountainous Pyrenean area you can go to Boutique Nepal which is excellent with a very good staff and where you can find lots of possibilities for adventure sports. You can find also many different shops like Bolsos Gloria. The main attractions that Huesca offers are Huesca Cathedral, Santuario De Torreciudad, Huesca Museum, town hall and numerous of old buildings. You can find also a range of other outstanding natural attractions such as the Ordesa y Monte Perdido National Park, declared a World Heritage Site by the UNESCO. Huesca has a typical mediterranean climate for a mountainous area. Indeed, the winters are cold and summers not very hot apart from the higher areas where temperatures are more extreme both in summer and winter. It snows and rains moderately from autumn to spring. Temperatures range from 5ºc to 24ºc in the capital of the province. You can find a wide variety of bus and minibus of about 40 companies in every locations of the city, city tours or taxis. There is also an airport which is 7 miles from downtown via Huesca a Alcalá del Obispo Highway. Otherwise, you can reserve limos or other luxury cars in Huesca.